Ray Prouty one is considered to be one of rotorcraft community's pioneers. Prouty's achievements in the technical field, and commitment in sharing his knowledge with others, in particular students and new engineers. His lectures, articles, papers and books have helped educate generations of rotorcraft engineers. Prouty held a BS and MS in aeronautical engineering from the University of Washington and an Engineer’s Degree from Caltech. He joined the fledgling American Helicopter Society (as we were then known) in 1952, when he began his career at Hughes Tool Company. He remained there until 1954, and then worked at Sikorsky Aircraft as a helicopter aerodynamicist from 1956 to1958. He was a stability and control specialist at Bell Helicopter 1958 - 1960, then group engineer for helicopter aerodynamics at Lockheed Aircraft (1960 - 1973). 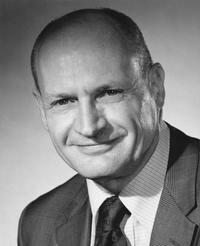 From 1973 until his “retirement” in 1987, Prouty was Chief of Stability and Control, Hughes Helicopters / McDonnell Douglas (now Boeing in Mesa, Arizona). He taught helicopter aerodynamics courses throughout the world after retirement. He also wrote Helicopter Performance, Stability and Control (1989), a college textbook, and Military Helicopter Design Technology (1998). Prouty was the author of the “Aerodynamics” column of Rotor & Wing magazine for more than 20 years, which he moved to Vertiflite in 2000. All of these columns can now be purchased in compendia, published by Eagle Eye Solutions (Volume III is forthcoming). Prouty published more than 80 articles in the AHS Vertiflite magazine since 1982, including his 75th and final column in this issue. Ray’s avid interest in local history, geology, and botany culminated in a book published last year called Westlake Village: A City in the Country. Joyce and Ray served as historians of their Westlake Village for more than 25 years. Ray Prouty passed away on September 26, 2014.